Yesterday, I touted the seemingly positive direction that Haven Distributors are taking and how they have a shot at success. The folks at ComixTalk felt I was a bit overly optimistic. They're absolutely right that I haven't seen Haven's business plan or any of the financials and, as I noted originally, there's some factors well beyond their control that aren't helping. And all of those things suggest that Haven isn't going to do any better than Cold Cut. But the reason why I figure Haven has a chance is because Diamond doesn't. Diamond is a huge corporation. I mean, they'd have to be to be able to ship north of 6 million comic books every month. That's $30+ million in revenue. Every month. To facilitate that kind of operation, you needs lots and lots of infrastructure. Lots of warehouse space, lots of truck drivers, lots of packing material, lots of middle managers... I offer no commentary on that, I just want to make sure everyone knows that they need a lot of resources to move that volume of material around on an ongoing basis. So, what happens to Diamond if Marvel and DC go away? If Diamond lost that much business within, say, a twelve month timeframe, they'd either have to close shop entirely or dramatically alter their operations with tons of layoffs and warehouse closures and whatnot. You can't lose over 90% of your business and continue operating as normal. There'd be lots of chaos and confusion within and around Diamond, in which case Haven would be ideally situated to step up to the plate and help all the worried comic retailers who don't know whether or not Diamond even got the order they placed, much less will be able to fulfill it. "But," you say, "DC and Marvel aren't just going to 'go away'." Well, not as companies, no. But consider what's been going on. Almost every year since Marvel emerged from bankruptcy, they've gotten a larger and larger share of their income from venues outside comic books. Within digging around for specific numbers, I want to say comic book publishing only accounts for around 20% of their revenue these days. That trend is likely going to continue and the higher-ups at Marvel are eventually going to start thinking that they shouldn't bother publishing comics since they get so much more income from movies and licensing deals. Now, I'm not about to suggest that Marvel is going to discontinue comics entirely, but I suspect that the pamphlet books they produce will get trimmed back over the next 5-10 years. Do they go more towards graphic novels to cater to the wait-for-the-trade crowd, or do they go full-on digital subscriptions, or what, I don't know. But I can't forsee them continuing to produce comics in the way they have been over the past decade. Maybe Marvel doesn't 'go away' entirely, but I suspect their revenue stream from the direct market (i.e. Diamond) is going to diminish perceptibly. What about DC? I can't see things remaining the way they are, but I have more trouble seeing how they're going to change. Their foray into digital publisher, Zuda Comics, has been successful in its own right, but there's so far been a very clear distinction drawn between Zuda and the DC properties that are more widely known -- Superman, Batman, Wonder Woman, etc. Their trade paperback program seems very successful and prevalent in the more traditional bookstore market, so it's possible that might be ramped up even more. Their Vertigo line, in particular, has even been a leader (of sorts) in the direct-to-trade graphic novels, so it's possible that might be expanded to include DC's more "mainstream" characters. Here again, I don't see DC just disappearing off the face of the earth, but all the realistic options I forsee for them involve decreased involvement with the direct market. If/when Marvel and DC cut back -- and I suspect they'll do so more-or-less simultaneously, since they've historically made significant changes roughly in tandem -- that will absolutely kill a good number of retailers. And it will absolutely cause all sorts of headaches and ulcers for all those working in the comic industry. But it won't kill all the retailers, and there will continue to be SOME market for pamphlet comics. Just like there is, despite the anecdote, a market for buggy whips. (It's an obscenely small market compared to once-upon-a-time, but it's still there.) But Diamond is set up and established to run a large scale operation, and is far too massive to survive such a change. At least not in a recognizable form. Haven, with all of six employees, has a better ability to make whatever changes are necessary to flow with changing market conditions. I don't wish the folks at Diamond ill will, by any means! I'm sure the vast majority of them are good people who love comics and are just trying to make a living. But I see BIG changes on the horizon, and I think Diamond is just too big and too reliant on too few publishers to really be able to survive the seismic shift that's coming. I point that out because people still want comics. Even the ones who haven't bought them for years. But they're looking for comics in a different way than has been established for the past couple decades. Personally, I think digital is the way to go, but I'm realistic enough to realize that it won't be fully embraced for at least a generation. But a shift -- even if it's to something OTHER than digital -- is coming. The audience is there; they're just waiting for the right venue. I don't think Diamond is, as a company, nible enough to catch that wave when it really starts to take shape, and that's why I'm optimistic about Haven. A thoughtful column, to be sure, if a little bit too "sky is falling" in its presumption. Yes, Marvel has seen a drop in its percentage of total revenue coming from publishing in the last 10 years. But that doesn't mean there's an attendant drop in dollars, but rather that the licensing and movie business end of Marvel have grown so huge. In short, there's a danger in looking at percentages as opposed to real numbers. There still isn't another economic model that works as well as publishing being the creative core driving the other facets of business (movies, licensing, digital, etc) continue to hum. I have a real fear for the traditional comic book. They are more expensive than other forms of entertainment. They are ONLY available in specialty stores. The consumers who purchase them are increasingly aging. None of this bodes well for the industry. 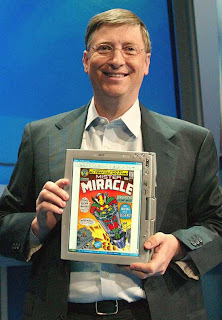 I agree that digital publishing is the future of comics. It is what consumers are clamoring for, and the format that has the greatest chance for discovery by new readers. All of this points to the eventual decline of Diamond. At the very least, Diamond will have to rethink its business model. What is the role of a distributor in a paperless world? "That trend is likely going to continue and the higher-ups at Marvel are eventually going to start thinking that they shouldn't bother publishing comics since they get so much more income from movies and licensing deals." But where do the ideas(i.e. exploitable properties) for these movies and licensing deals come from? Comic books. And who are responsible for creating these comic books? Writers and artists. As long as the Marvel and DC print divisions continue to be profitable, the companies will not go anywhere. Of course, one could convincingly argue that Marvel and DC haven't had any original ideas in decades. If you cancelled all their comics immediately they could probably go on for years making movies and toys with the characters they have. But where would future exploitation of artist's ideas come from if not from them? "...traditional comic book(s). They are more expensive than other forms of entertainment." Personal opinion is not the opinion of the entire market. "They are ONLY available in specialty stores." While this may be mostly true for periodical comics, the number of outlets for book-form comics has grown significantly in the lst several years. To a degree, mass market bookstores have become the feeder markets the comic book specialty retailers. "The consumers who purchase them are increasingly aging." I can only speak from personal research and observation, but I can tell you this is the healthiest time for kids' comics in many years. While it may be somewhat true that kids don't buy a lot of comics, it doesn't mean that a lot of comics aren't being bought and read by many kids. "...digital publishing is the future of comics. It is what consumers are clamoring for..."
It may be what *some* consumers are clamoring for, but there is no qualified research I know of that says consumers are only clamoring for digital comics. Blanket statements are too often used in these online discussions with no real facts to support them. I will concede the point to FlyCoJo that I did not have hard evidence to back up my assertions. I have done a little light googling and come up with the following. John Goldwater, the president of the Comic Magazine Association of America stated that circulation from 1959 to 1978 dropped from 600,000,000 to 250,000,000. Looking at current numbers (2009 sales charts), circulation is down under 100,000,000 annually. During that time, the number of retail options has dropped dramatically for the consumer. Even though the number of large booksellers carrying comics has increased, that does not mean that Diamond is going to get much out of the deal. And, carrying comics in a book store does not correlate to increased traffic in comic shops. Quoting from Wikipedia, "However, the growth of interest in comics among mainstream booksellers and book publishers has led to several publishers arranging for bookstore distribution outside of Diamond." Neither does the increased exposure from movies and television. Retailers have not seen any sustained increase in readership after the release of blockbuster movies based on comic book properties (again, see current sales figures http://www.comicbookresources.com/?page=article&id=21159). ...traditional comic book(s). They are more expensive than other forms of entertainment." Comics cost between $3.50 and $3.99 for 22 pages of story. Despite initial value per item, Trades and Gn's are currently hitting the same price levels. The most recent Iron Fist Trade was $19.99 for 4 issues. Yes, a comic shop might offer that for 10 - 15% off, but most bookstores will not. Now, assuming that you will spend one minute per page (a generous assertion), that gives you a cost per minute of between 16 and 18 cents. A movie at New York City rates of $12, gives you a cost per minute of 10 cents (for the current Wolverine movie, which I rounded UP to two hours in length). "The consumers who purchase them are increasingly aging." According to this study (http://www.buowl.boun.edu.tr/sample%20research%20projects/comics.htm) Comic sellers stated that comic readers are over 30 but there are no more common features. So, the only thing buyers have in common is that they are over 30? I agree that there are plenty of comics aimed at kids, but that does not mean kids are reading them or buying them. And, now that the vast majority of Marvel and DC books are not published for kids (they have taken off the Comics Code Seal, and are now rating their comics above "kid" ages on all but a few comics), I think it is unfair to say that "this is the healthiest time for kids' comics in many years." "It may be what *some* consumers are clamoring for, but there is no qualified research I know of that says consumers are only clamoring for digital comics." If consumers are not clamoring for them, then why are Marvel and DC actively trying to create digital content? They would not mess with a publishing program that is proven to succeed if there was not a demand from the consumers for them to make such a change. Diamond has to be nervous. Comic sales are a fraction of what they once were...and they continue to decline. Diamond's two largest clients are looking outside Diamond's scope to meet the only sections of the market that are growing (trade collections in bookstores, and digital distribution). I don't think that Marvel and DC are going anywhere. My assertion was that Diamond may be nervous and that traditional comics as we know them (the 22 page floppy), are in danger. Now that I have numbers and research to back up my assertions and anecdotal evidence, does that help? "Even though the number of large booksellers carrying comics has increased, that does not mean that Diamond is going to get much out of the deal…Quoting from Wikipedia, ‘However, the growth of interest in comics among mainstream booksellers and book publishers has led to several publishers arranging for bookstore distribution outside of Diamond.’"
Ever hear of Diamond Book Distributors? Diamond IS in the mass market, so the increased exposure of comics and graphic novels in mass-market bookstores does indeed help Diamond. "carrying comics in a bookstore does not correlate to increased traffic in comic shops." I can only give you anecdotal evidence here, but the local Barnes & Noble and Border’s both serve as feeder stores to my specialty shop. The comic fans on staff at those stores often refer customers to us, knowing our selection is deeper, we get the comics sooner and we tend to know more about what we’re selling since we’re specialists. As for the increased exposure from movies and TV, sure, if the Spider-Man movies had really worked their magic, then the Spidey comics would be selling millions per month. Conversely, there are 1.5 million copies of WATCHMEN that have moved in the last 10 months, a significant portion of which sold through direct market shops. So at least on occasion, other media have moved the comics’ sales needle. Media sensations, though, tend to be just that: quick jolts rather than sustained patterns. As for your treatise on comparing the prices of other forms of entertainment to the cost per page in a comic book, that’s really an apples/oranges deal. The fact is, if you personally feel as though you are not being satisfied with the entertainment you’re getting from any medium- TV shows, movies, comics, whatever, then it is "too expensive." But there are still a tremendous number (albeit not as tremendous as I would like) of folks buying and enjoying their comics---and getting valuable entertainment from them. Please let’s not confuse "expense" with "value." "I agree that there are plenty of comics aimed at kids, but that does not mean kids are reading them or buying them." When I posted my last comment, I should have put an important qualifier in there. While many kids are enjoying reading comics, they are not doing much of the buying of comics. But we do see a healthy number of kids reading and enjoying comics that their parents buy for them. So an equal number of attendees were in the 17 and under group as were in the 35+ crowd. Kids do like comics. It is a healthy time for kids’ comics. But we do need more and better outreach to make sure they keep reading comics through the teen years. "If consumers are not clamoring for them, then why are Marvel and DC actively trying to create digital content?" 1) To cultivate a new market, perhaps? Did the onset of television put radio out of business? It’s the same argument but nearly 60 years later. Radio didn’t die, but it did change. 2) To protect the use of trademarked characters? 3) As a low-cost source of developing new talent? "Diamond's two largest clients are looking outside Diamond's scope to meet the only sections of the market that are growing (trade collections in bookstores, and digital distribution)." Well, Diamond does distribute Marvel books to the mass-market, so there’s that. "My assertion was that Diamond may be nervous and that traditional comics as we know them (the 22 page floppy), are in danger." In this economy, every company large and small should be nervous. Who knows what the next several months, let alone years, will bring? But there have been numerous times in the last 70+ years that the "death of comics" has been proclaimed. And I’m happy to say the patient still has a healthy heart, even if some don’t want to believe it. "Now that I have numbers and research to back up my assertions and anecdotal evidence, does that help?" "John Goldwater, the president of the Comic Magazine Association of America stated that circulation from 1959 to 1978 dropped from 600,000,000 to 250,000,000. Looking at current numbers (2009 sales charts), circulation is down under 100,000,000 annually." I know which of those numbers like best! Granted, there’s no adjusting for inflation, but quoting raw circulation numbers is a mug’s game. The world has changed a lot since 1978, let alone since 1959. "In 1995, Diamond comics estimated there were only 5900 retailers in USA. Cap City also estimated 5900. Heroes World estimated 5000. Source. In 2001, John Jackson Miller estimated that there were only 3000 comic retailers." I’ve heard an estimate of as many as 10,000 different "accounts" held by the distributors in the ’93 era. Don’t know how many "stores" that equaled, since some retailers held accounts with multiple distributors. In 1988, when I opened Flying Colors, there were roughly 3000 comic shops. Now there are marginally less than 3000, and Diamond may have 3000-3300 accounts. The 5900 number you quoted was during the post-boom purge that hit bottom in the late ‘90s. I guess the reason I jumped in here is to stand up for the solid and sometimes spectacular work that specialty retailers do every day. The rush that some seem to feel about throwing out (or dooming to extinction) the comic book format is presumptuous, misguided and often counter-productive. Diamond is not THE mass market. Diamond is THE DIRECT market. Diamond is the main supplier of comics to comic shops. It is not the main supplier of comics to the mass market. The mass market is supplied by a variety of distributors. And, when it comes to comics, book stores such as Amazon and Barnes & Nobles stock predominantly manga. Manga is not distributed to book stores through Diamond. So, Diamond is not the mass market. It is a small portion of the mass market. Exactly. Media exposure is a quick jolt rather than a sustained growth. Unfortunately the sustained pattern is downward. What we need to do is figure out how to reverse that trend. Yes, I said we. Because I agree that retailers are great people who know their products and do a good a spectacular job of selling products to people who are already in their stores. The real question is: How do we get people in to the stores? How do we get people to shop at their LCS and buy comics? How many of those customers who came in to your shop were new customers? What percentage returned the next week? What percentage of the new shoppers were there the next year? What is your ROI on FCBD? FCBD is not fair to retailers. It puts all the burden on the retailers and none on the distributor or publisher. Retailers have to purchase the comics. Retailers pay for the advertising. Retailers are stuck with all leftover products. “As for your treatise on comparing the prices of other forms of entertainment to the cost per page in a comic book, that’s really an apples/oranges deal. You asked me to provide evidence to back up my assertion that comics are more expensive than other mediums. I compared them directly to another entertainment medium that is heavily influenced by comic books: summer blockbuster movies. Since that is not a good enough comparison, then how about books? Books are escapist fantasies, come in a variety of formats (paperbacks, hardcovers, e-books, etc. ), appeal to all ages, and are sold through a variety of outlets (specialty shops, online retailers, supermarkets, big box stores, etc.). A paperback retails for $7.99. Hardcover for $24.99. At 250 pages (on average. There are some that are less, many more that are significantly longer) that still comes out to a much better cash value. I don’t deny that there are other intangibles involved in comic book buying. Collectability, nostalgia, and character/brand loyalty all play a part as well. But, you did not ask about intangibles. You asked for facts. If you would like to compare comics to something closer than books, then how about periodicals? They are both published monthly. They both cover a variety of topics. They are both supported by ad revenues. They contain both pictures and words. Again, when comparing size and cost, magazines provide far more than 22 pages of entertainment (often well over a hundred pages more) for just a small difference in price. Again, the value is better. And, yes, when looking at two items side by side, it is a giant leap of faith to spend $3.99 on an item that you can flip through in 15 minutes, and not choose the People Magazine at $4.99 that is 5 times as large and you can spend a leisurely afternoon reading. “"If consumers are not clamoring for them, then why are Marvel and DC actively trying to create digital content?" 3) retailers and consumers regularly report that cost is a significant barrier to attracting new readers. By controlling all parts of production and distribution, the companies can maximize profits and cut out the middlemen. 4) No one figured out how to make a profit on television when it was first introduced. Good thing they stopped work on that project. Any time that someone declares that there is an 83.3% loss in circulation, and a 50% loss in retail outlets is not something that I would consider healthy. I agree. A lot has changed. 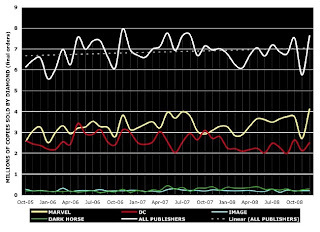 Comic prices have far outstripped inflation (source: http://www.comicbookresources.com/?page=article&id=18583), retailers have been forced to accept comics on a non-returnable basis (shifting the cost burden from the publishers and distributors to the retailers), and Al Gore invented the internet (allowing us to have this discussion). Before you ask, I will tell you what I think we should do. We need to get comics back in to the hands of the people. Take them back in to the convenience stores. Put them in new locations (can you imagine sales if comics were sold in Starbucks??? ), diversify the comics at locations (most books not published by DC or Marvel are not ordered at a rate of even 1 per store, and develop an new distribution system; a new distribution system that works for both small publishers and retailers must be developed. (Diamond’s monopoly is not helping). Most importantly, retailers and other comic professional organizations need to embark on a campaign to change the public’s awareness and perception of comics. (Face it. The most publicly recognizable face of comic books is the Comic book Guy from The Simpsons. Not exactly a favorable image). I love comic books. I want them to continue. I want them to flourish. I want to return to the days when comics sold 250,000 copies; where comics were part of our common cultural experience (not a common cultural joke). Deluding ourselves in to believing that comics are just fine the way they are, and that nothing needs to change is not the way to do this. "Diamond is not THE mass market." I never said that. I said "Diamond is in the mass market." Diamond Book Distributors distributes a number of publishers to the mass-market, including Marvel. "Unfortunately the sustained pattern is downward." Did you know that comic book sales to comic shops had gone up incrementally each year from 2000-2007? There was a slight dip in 2008, but given the economic calamities happening all over the world, a fractional loss was not wholly unexpected. "What we need to do is figure out how to reverse that trend." "How do we get people in to the stores?" "How do we get people to shop at their LCS and buy comics?" "Free Comic Book Day is not the answer." Well, you might be surprised to find that I agree with that to an extent. FCBD brings an estimated 500,000 people into comic shops each First Saturday in May. And while it’s true that not all participating stores do great with that event, there’s still enough enthusiasm for it after eight years that it will continue. FCBD is not the only answer, but it is one of the answers. As an event to "get people in stores" it is the single most successful industrywide promotional event that comics have ever seen. No brag, just fact. "As great of an idea as it is, it does not bring in a significant number of people who do not already shop at the store." Out of nearly 1100 store visitors to Flying Colors on FCBD two weeks ago, almost 200 of them had never been to our store before. That’s on the 8th annual event! If after eight years of the event new people are still finding their way to local comic shops, if the retailers give an honest effort to make something of the day. The anecdote you quoted--- "He also said his sales don't really go up even the day of FCBD and he has to clean up his parking lot of free books that he paid for. So he leaves giving away comics to the local chain store Hastings." --- sounds like another dinosaur dealer waiting to become extinct. If FCBD was a failure for retailers, there’s no way it could be looking forward to its 9th annual event on May 1, 2010. "FCBD is not fair to retailers. It puts all the burden on the retailers and none on the distributor or publisher." There have been many times I’ve been critical of publishers and Diamond, but FCBD sure isn’t one of them. Everyone in the marketing chain of comics, from the publishers to the printers to Diamond to retailers all have costs associated with making the event work. Each retailer can do whatever they want with the event, customizing it for their market, for their store--- and yes, it is partially on the retailers’ shoulders to stir up some enthusiasm for the event. That’s what "promotion" is. "You asked me to provide evidence to back up my assertion that comics are more expensive than other mediums…"
"… A paperback retails for $7.99. Hardcover for $24.99. At 250 pages (on average." "… when looking at two items side by side, it is a giant leap of faith to spend $3.99 on an item that you can flip through in 15 minutes, and not choose the People Magazine at $4.99 that is 5 times as large and you can spend a leisurely afternoon reading." Thanks for proving my "apples/oranges" point. Bottom line, I’ll stand with my plea to not confuse "expense" with "value." "Any time that someone declares that there is an 83.3% loss in circulation, and a 50% loss in retail outlets is not something that I would consider healthy….Profits have increased slightly since 1978, but are still down 36.2%, not UP 498% as you asserted." "…retailers have been forced to accept comics on a non-returnable basis (shifting the cost burden from the publishers and distributors to the retailers)"
Time for a history lesson: retailers asked for comics to be sold to them on a non-returnable basis in exchange for a deeper wholesale discount. See: "Phil Seuling". "We need to get comics back in to the hands of the people." Half a million people got comics put in their hands on May 2nd, just as a reminder. But we do need to do more. "Take them back in to the convenience stores." History lesson #2: Marvel did just that with 7-11 a couple of years ago. The results were mixed even if the attempt was a valiant one. "Put them in new locations (can you imagine sales if comics were sold in Starbucks???)" I’m all for new locations for comics, but the leap from here to there is the Grand Canyon wide while the comics’ market is working on Gary Coleman legs.
" diversify the comics at locations (most books not published by DC or Marvel are not ordered at a rate of even 1 per store"
I’ll bet that guy you mentioned above—the one who had to pick up FCBD comics from his parking lot?--- is deep in the Big Two and not so diversified into any other kinds of comics. Just a hunch, though. "and develop an new distribution system; a new distribution system that works for both small publishers and retailers must be developed. (Diamond’s monopoly is not helping)." Diamond has a "monopoly" on several large publishers. It has no such monopoly on the distribution of hundreds of other publishers. At the distribution level, margins are the tightest---and there’s very little margin for error. It’s not a business for the faint of heart. And at this point, there is no indication that anyone would want to step in a spend millions developing a "new distribution system". Although, to be very blunt, digital publishing is a "new distribution system." So there’s that. Maybe the biggest problem with indies---and why many retailers are so focused on the Big Two--- is that smaller publishers, self-publishers, especially, just don’t do a very good job building demand for what they produce. There’s a dearth of marketing savvy in the small press community. It’s just not as simple as "produce it and they will sell". "Most importantly, retailers and other comic professional organizations need to embark on a campaign to change the public’s awareness and perception of comics." Again, that’s part of what FCBD was designed to do. We really do need more industrywide promotion and outreach. ComicsPRO is working with a number of "pre-retailers" in our mentoring program---did you know that? It may not be the kind of huge splash that the market could really use, but it’s part of our mission to grow the comics specialty market, so helping new and fledgling retailers attain their goals is a good thing. Comics are deeply entrenched in our culture. More than ever. Look around you ---TV, movies, books, advertising, anything visual --- we’re soaked in comics-inspired images. Doyou think movie producers, advertising executives and the like would use comics’ imagery if there were a negative "public perception"? Not likely. "I love comic books. I want them to continue. I want them to flourish." I’m with you. I’ve dedicated the last 20+ years of my life to just that. "I want to return to the days when comics sold 250,000 copies"
And I want a pony, too! Maybe, someday, if we’re all good. Again, the world has changed. When we see major metro newspapers shutting down, magazine distributors wanting to charge an extra fee per each mag distributed (because sales are so far down), then you know comics seem to be in a better place. Maybe not for long, but there isn’t a publisher in existence that wouldn’t love a title or two with a 250K circ, while they know most titles can be profitable at a fraction of that 250K sales. "…where comics were part of our common cultural experience (not a common cultural joke)." Look, I’m all about unfurling the Comics Flag and waving it from all the most visible places, but what you’re asking for takes generations, not just a few years. I am convinced, though, that many of today’s comics’ characters will be remembered far into the future as the myths of this era. "Deluding ourselves in to believing that comics are just fine the way they are, and that nothing needs to change is not the way to do this." The salient point is that comics are fine the way they are, entertaining millions, employing thousands--- but I won’t ever be satisfied until everyone who is a regular reader is also a regular comics’ reader. You know what Joe? I think this conversation is over. I was attempting to have an academic conversation about a medium that I thought we both loved and wanted to keep going. I take that back. A medium that we both loved and wanted to see grow and flourish. But, that conversation has ended. Instead of sticking to the facts, to the points at hand, and to the spirit of dialogue and conversation, you devolved this in to the makings of a flame war. Statements such as, “but the leap from here to there is the Grand Canyon wide while the comics’ market is working on Gary Coleman legs,” and "Don’t start vast projects with half-vast ideas." (Better if you say that aloud,)” and “And I want a pony, too! Maybe, someday, if we’re all good,” are not designed to carry the conversation forward. So, it appears we have reached the end. I am disappointed that you chose to end the conversation. I was enjoying reading your posts and researching the facts and figures. It gave me an opportunity to explore a side of the industry that does not get enough attention. If you decide that you would like to return to an academic discussion, let me know. I have plenty left to say on the subject. Diamond Book distributes Marvel, Image, IDW, Dark Horse, Slave Labor, Oni, and many other small press graphic novel publishers. If Diamond fails, the comics industry fails, as distributor bankruptcies adversely affect publishers. DBD's trade distribution also affects libraries. Libraries are the "other direct market" (they do not return titles for credit) and they purchase most of their books via trade distributors. Libraries offer a selected offering of graphic novels to a wide audience. If it is more difficult for libraries to acquire graphic novels, then libraries will offer fewer graphic novels. Children may not purchase graphic novels or comics in large numbers. Children also do not purchase picture books in large numbers. However, children's books was one of the few bookstore categories to show growth during the Fall and Winter quarters of last year. Why? Because ADULTS buy books, and parents will sacrifice for themselves so that their children will not have to. Graphic novels are a great way to get reluctant readers to read. Librarians and educators know this, and actively acquire graphic novels for use in the classroom. Why does Marvel Illustrated exist when the comics sell so few copies? Because the book trade will buy the collections. We are in the middle of a Renaissance! People no longer look at comics as subliterature. Gone (for the most part) are those stupid "POW! BANG! Comics Aren't For Kids Anymore!" headlines. Comics are getting mainstream acceptance and awards and sales. Young children and teen girls are reading comics in numbers not seen since the 1950s! We see fewer floppies? Fine. Comicbook stores have to evolve into specialty bookstores with POS systems and clean floors? GREAT! (Goodbye, Android's Dungeon!) The future is kids drawing on their desks (see: Matt Groening) or posting comics on their blogs or taking classes in high school. Diamond Comics doesn't just distribute comics. A loss of comics periodical business due to digital comics might be replaced by an increased business in trade books and licensed merchandise. Will e-comics be available only via a publisher's website, or will online retailers (including comicbook stores) be able to sell the digital files just like they sell the paper formats? For clarification purposes, the graphic above represents copies shipped of titles in the Top 300 each month, not the percentage of items Diamond ships overall. "Instead of sticking to the facts, to the points at hand, and to the spirit of dialogue and conversation, you devolved this in to the makings of a flame war." I countered your facts with other facts and actual experiences from my 20+ years in this business. If the only facts you want to believe are the ones you come up with, this otherwise productive discussion will devolve. Hopefully that is something with which we can all agree.